Antonio Abete adds he's 100% confident everything will go ahead as planned. At a time of economic crisis in Brazil, they're doing it on a strict budget. But his team are promising a spectacle that will be bigger and better than London 2012, which cost $40m (£31m), and was directed by Danny Boyle. Mr Abete works for Filmmaster Events, and is answerable to the International Olympic Committee for delivering a show that will be watched by a global audience of around three billion people. "The budget is completely different. We cannot say the real numbers, firstly because we are not allowed, but secondly because it's really difficult to know what the real number is. "It's much less than London. It's because in Brazil everyone knows what the situation is, economically and politically. It's correct to invest money in the opening ceremony, but I think it's also correct to invest the right money. "We are completely confident we can create an amazing show, without spending the huge amounts that the previous Olympic ceremonies had." So, what will actually be in the opening ceremony? 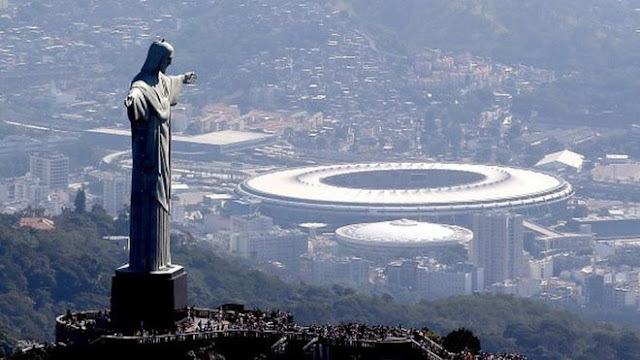 As usual, the plan will be for national teams to arrive in the Maracanã stadium to the cheers of the world. The creative directors are Brazilian filmmakers Fernando Meirelles and Daniela Thomas, with a cast of some 6,000 volunteers. The internet is full of rumours of new technology - such as drones - being used, to be merged with samba and carnival themes to create an aerial display to remember. Antonio Abete gives a tight-lipped smile. "Now you are asking me to tell you something that is secret, but I will tell you something. Usually the opening ceremony of the Olympic Games focuses on the culture and the history of the host country. In this case, we'll be different, because Brazil is an incredible country. "In Brazil you cannot find only one culture, but more than one. Let me say, more than two, three or four. So, it will be a mix, and we will create a show, the biggest event in the world, not just Brazillian culture but world culture." The secret will be out in less than a month, with the ceremony taking place on Friday the 5th of August. The full interview can be heard on the BBC World Service radio on World Business Report at 1830 BST on Friday 8 July, and again on Business Matters at 0100 BST on Saturday 9 July.